� The Inca Trail has ten different climatic zones and sub-zones, from deserts to tropical Andean cloud forest; home to exotic plants and animal life. The trail is covered with over 400 varieties of orchids, begonias, trees, and bushes as well as a varied collection of fauna including the condor, pumas and miniature deer. � Stunning scenery with the snowy peaks of the Andes (over 6,000 metres), fast flowing rivers and deep valleys. � Machu Picchu, the 'Lost City of the Incas' is the best-known and most spectacular site in South America. Machu Picchu are quechua (indigenous Indian) words that mean "old" and "mountain". 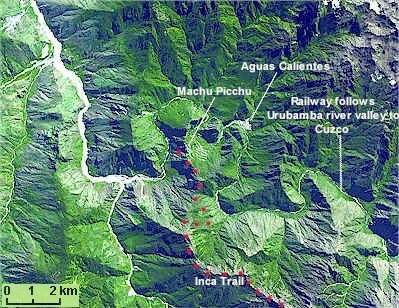 � Hiking the "Inca Trail". This was the Royal Highway that led pilgrims and officials of the Empire to the Sacred City of the Incas. The Trail is paved with blocks of stone, It has stone stairways, tunnels and wooden bridges. The trek is 32 kilometres long starting at kilometre 88 of the railway and ending at the Holy City. � The nearby town of Aguas Calientes has thermal (hot water) baths. � Pisac is the main craftwork centre on the high plains. The main square is small, with a colourful market on Sunday mornings.